Did You Control the Run, Or Did the Run Control You? Tighty shorts. Because the toe shoes aren't awkward enough. This has become something of a mantra for my wife and I. We ask it after workouts or races. We ask it of ourselves, and we ask it of each other. Ultimately, it's a way of opening a conversation about the nature of our effort. Sometimes a run remains within the bounds of our labor--lungs and legs work hard, but never beyond what we can handle. Other times, though, the lactic acid and muscle strain can become oppressive and onerous. The fatigue takes us over, it owns us. Last year at around this time, every run was controlling me--no exception. 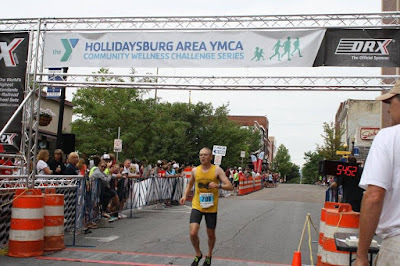 In fact, on July 4, 2015, I had my "first run" after a prolonged injury. I remember distinctly trudging down the street, faintly aware of what it felt like to run. This thing that I did was once was so ordinary, so mundane. Now running was entirely new to me. I was a stranger to the sport. After three miles, my GPS confirmed that I had a lot of work to do. But I was just happy to be back on the road again. I'm not the same person when I can't run. I'm more irritable. Less focused. And entirely out of sorts. When I am running, though, every morning has a familiar rhythm. It's almost monastic. And then there is the community. I met my wife through running. And many of my closest friends are fellow runners. So I promised myself to have one goal over the following year: no injuries. Keep the miles moderate. Take at least one day off each week. Do those little extra things--core workouts, foam roller, clean eating. While I had a few little things catch up to me, I got through the year relatively unscathed. So on July 4th of this year, I decided to celebrate by running a 15k with some friends. Coincidentally, this was the first race that I ever did. It was 1990. I hadn't finished a run of over 6 miles in my entire life. But the mind of a sixteen-year-old male rarely makes good decisions. I have only vague memories of it. Heat and hills mostly. And getting passed by crowds of people. But I know that I finished. I also know that this is the one race that I have run the most in my life. Seven times, if I count this year. For most of them, I would say that the race controlled me. Sometimes it has been the weather. Other times my lack of preparation. One time my opening 5k was near a personal record for that distance. This year was different, though. It wasn't my fastest time for 15k. Or for that course. But when I finished, I had a measure of control over myself and my effort. Don't misread this. I certainly did not control the terrain, conditions, or competition. Rather, the control was entirely interior, the result of a year of uninterrupted training and over two decades of experience in the sport. For 9.3 miles, I stayed aware of my limits, of my potential, and of my overall sense of wellbeing. I suppose that is the great gift of running--of having an opportunity to test yourself, to succeed or fail, and to grow from the experience no matter the outcome.